Pitbull Prejudice…Where has the logic gone? 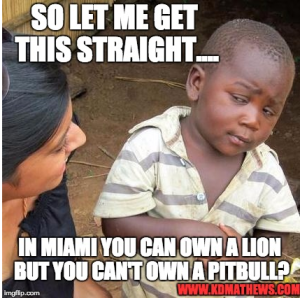 So let me get this straight, if you live in Miami, you can obtain a permit to own a tiger, or a lion, or a crocodile monitor, but you can not under any circumstances own a pit bull terrier? How is this possible? How can this even go from moronic fantasy to an actual piece of legislation that was thought up, proposed, written out, presented, voted on, and then subsequently accepted by the populace? I realize this is nothing new. This is actually old news, but its such a mockery of not only justice but also common sense, that I feel the need to write about it today, and I will again multiple times in the future trying to reach as many people as I can until something is done about it. Back in April the legislature of Miami-Dade county actually did something intelligent, I know, a legislature actually doing something that makes sense made me feel like Ashton Kutchner was about to jump out and scream YOU’VE BEEN PUNKED!! What they did was vote 11-1 to repeal the county wide ban on pit bulls IF the voters approved. I am praising the legislature simply because what they did is the closest thing I have seen members of any representative branch in this country actually trying to represent their people. Unfortunately the people voted against repealing the ban with 63% wanting it to remain in place. I realize that there has been quite the media frenzy and mis-information campaign against the pitbull terrier in this country. I also realize that for many people, the only information they have been given on the breed is negative. What I fail to realize is how anybody, in their right mind, can rationalize the fact that it is ok to own a LION or a TIGER, but it is not ok to own a pitbull. Please somebody who voted to maintain the ban, contact me, EDUCATE me, I am a very open minded person and am always willing to shift my position on any number of topics if and when I am presented with a valid evidenciary (yes, i made that word up, feel free to use it) based argument. Explain to me why it is less dangerous to own a 600lb wild predator than to own a 50lb dog that is also one of the most stolen breeds in the country due to its overly friendly disposition to humans. 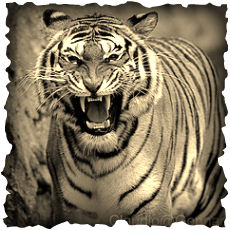 You can imagine the roar of the silence that followed.